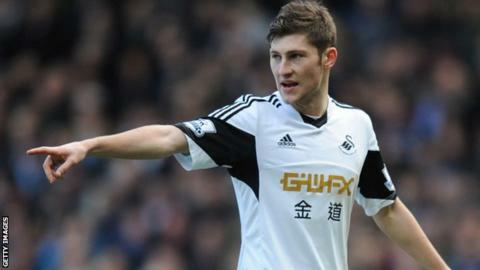 Tottenham Hotspur have expressed an interest in Swansea City defender Ben Davies. The 21-year-old Wales international could become Tottenham boss Mauricio Pochettino's first signing. Davies has played 71 senior games for the Swans and is the first choice for Wales at left-back. Welsh-speaking Davies hit the limelight at the Liberty Stadium during the 2012-13 season following an injury to fellow international Neil Taylor. Swansea manager Garry Monk is also facing doubts over the futures of strikers Wilfried Bony and Michu. Ivory Coast international Bony's agent has said he would only leave the Swans for a top-six Premier League club while Spaniard Michu is being linked with a possible move to Napoli after a frustrating and injury-wrecked 2013-14 campaign. Davies, who has risen from the youth ranks at Swansea, made his debut for the club as a 19-year-old in August 2012 and quickly established himself as first-choice left-back when Taylor suffered a long-term injury. His performances impressed Wales manager Chris Coleman, who handed the Neath-born player an international debut in the 2-1 win over Scotland in October 2012.